This is one of those dishes that you may take one bite and think is a bit bizarre—but then will keep eating anyway. Without fail, the bowl will get emptied. In the summer months, it’s particularly great to start the day with this cool, refreshing treat. 1.In a blender, combine the strawberries, mango, juice, and ice. 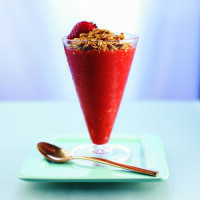 On high speed, blend until the mixture is almost smooth with a consistency somewhere between a slush and a sorbet. Pour into a cereal bowl or tall glass. Stir in the honey, if desired. Top with the cereal. Serve immediately.